A grand addition to your bedroom storage sweet, our 72" Amish Victoria's Tradition Dresser offers ample storage for your everyday items, along with an optional, complementary tri-fold mirror that brings the whole piece together and offers a simple way to make sure you're looking your best before you head off to face the day. Bench built from solid hardwood, with beautiful raised panel details, dental molding, ornate drawer front detail, and classically inspired feet, this beautiful dresser is sure to bring the Colonial period to any decor. The 72" dresser offers nine large drawers that smoothly glide on side-mounted full-extension slides, giving you access to all of your items inside. Inside, each drawer box is dovetailed and complete with a solid 1/2" drawer bottom that is capable of supporting more than 200 lbs. of live weight. In the center, a two door cabinet opens to reveal an adjustable shelf that is convenient for storing linens and folded clothes for easy access. Upgrade your dresser to include the beautiful aromatic cedar drawer bottoms and add the wonderful smell of natural cedar to all of your items, while offering a simple way to remove excess moisture from the drawers. 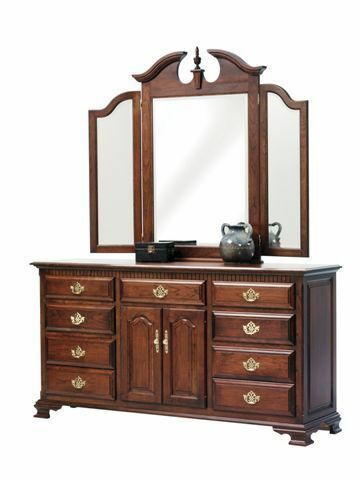 Each piece is made to order from select pieces of American Hardwood. Choose from a wide variety of different species and choose your favorite finish to complement your existing decor. Each piece can also be customized is the dimensions aren't right for your individual needs. Call an Amish Furniture Specialists today for a free custom quote on your new Victoria's Tradition Dresser. Inside Door Opening Width: 22"